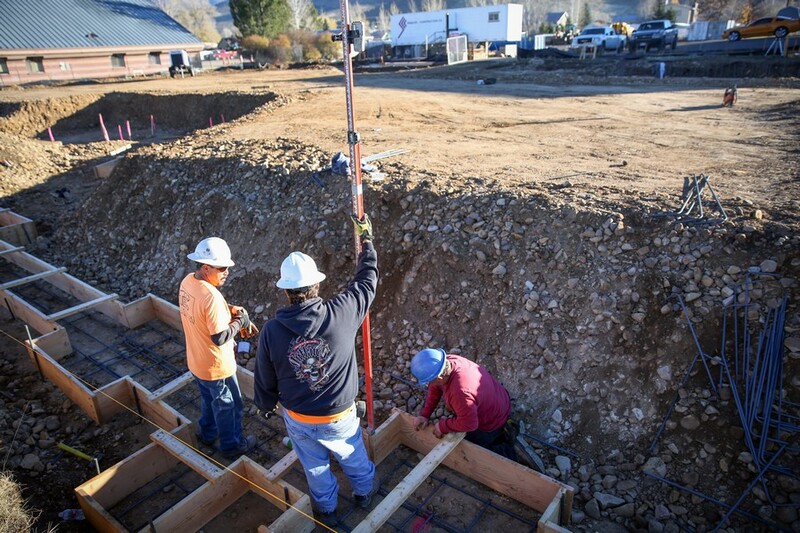 Construction crews prepare the foundation for the County Services Building in Kamas on Tuesday morning. Completion of the services building is the countys top priority for 2017. Summit County Council members were recently presented with a list of proposed projects for the coming budget year. The total comes to nearly $19.5 million, representing a slight increase from last year, with the lion’s share of the expenditures supporting facility projects. However, the recommended budget for capital projects is $2 million lower than Summit County Manager Tom Fisher’s recommendation last month. He suggested a nearly 29 percent increase over spending in 2016 in his budget recommendation, with $21.3 million going toward capital projects. While nearly $10 million is allocated for facilities, approximately $5 million is carried over for the completion of the County Service Building in Kamas. The remaining $5 million would support improvements to the expanded fairgrounds in Coalville. Council members are in the process of approving a master plan for the expansion of the site. Some of the road projects that are being recommended would be funded by revenue that is tied to the transportation sales tax initiatives. If the initiatives don’t pass, those projects will be deferred or removed from the list. The projects include design of the Jeremy Ranch/Pinebrook interchange, a remote parking lot at Ecker Hill and a joint project with Park City Municipal to improve State Road 248. The budget committee identified an additional $103 million worth of road projects. Another $3.7 million is being earmarked for the acquisition of the Cline Dahle parcel near Jeremy Ranch Elementary School for a potential affordable housing project, with $2.8 million coming from municipal fund balances, $1.2 million from open space funds and $120,000 from affordable housing funds. “One of the biggest projects is probably going to be the Kamas Building because since that was taken down and removed, the services have been displaced. It will be important to get that completed as soon as possible next year,” said Matt Leavitt, county financial officer. Leavitt said the council was “pretty receptive” to the recommendations that were made. He said the suggested projects were selected based on public input. Other projects that were identified by staff, that do not yet have funding sources, include: construction of a county senior center; completion of Phase 2 of the Kimball Junction Transit Center; solar upgrades and green waste improvements for the new landfill. The County Council will continue taking budget requests throughout the next several weeks. Staff may be required to adjust their recommendations based on the results of the propositions on the Nov. 8 ballot. Two public hearings will be scheduled in early December as part of the budget discussions. The County Council plans to finalize details by Dec. 14. The county’s overall budget must be adopted on or before Dec. 31.